Review iRise Platform roles and project permissions. Compare allowed capabilities based on user role, project permission. This article provides an explanation of roles on the iRise platform and permissions for projects. 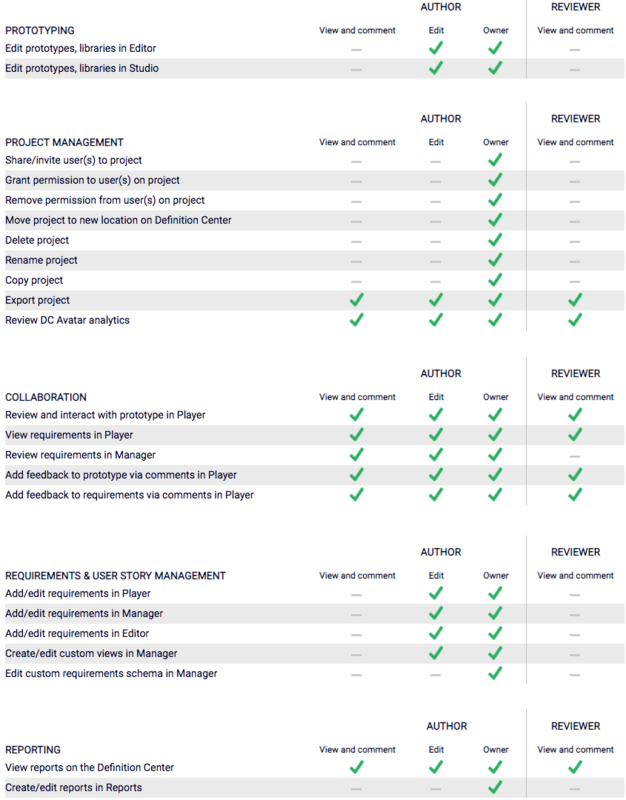 Compare capabilities allowed for roles (Author vs. Reviewer) and project permissions (View and comment vs. Edit vs. Owner) using the quick reference charts. There are two types of user roles defined on the iRise Platform, Author and Reviewer. Users assigned the Author role are allowed to create and edit iRise projects, like mockups, prototypes, and reusable asset libraries, using the authoring components of the iRise platform, Editor and/or Studio. Users assigned the Reviewer role are allowed to review projects (prototypes and requirements) and provide feedback via comments using the reviewing components of the iRise platform, Player and/or Reader. Reviewers are not allowed to access or edit projects using the authoring components of the iRise platform, neither Editor nor Studio. Note: There is a third user role called Contributor that has been discontinued, but not yet removed from the platform. This role was used by our Enterprise customers to access add-ons, which have now been discontinued. Users currently assigned the Contributor role have the same capabilities as Reviewers. This role will be dropped in future releases. Projects permissions are defined for each project individually. There are three types of permission for a project: View and comment, Edit, and Owner. Users with View and comment permission can review and interact with the prototype and view requirements in Player. Users with Edit permission can collaboratively edit the prototype and requirements with other users with Edit or Owner permission in Editor, Studio, Reports, Manager, and Player. Users with Edit permission also have the capabilities of users with View and comment permission. Users with Owner permission can invite users and grant or remove permission for the project, move the project to a new location on the Definition Center, and permanently delete the project. Users with Owner permission also have the capabilities with Edit and View and comment permission.